One of its most intriguing uses is for stuff what lives outdoors. I find a lot of shop bought things, like garden furniture and plant pots, a bit generic, and, dare I say, boring, but now I have another DIY option and an outdoor planter is just one of the ways I’ve played around with introducing decoupage in my garden. 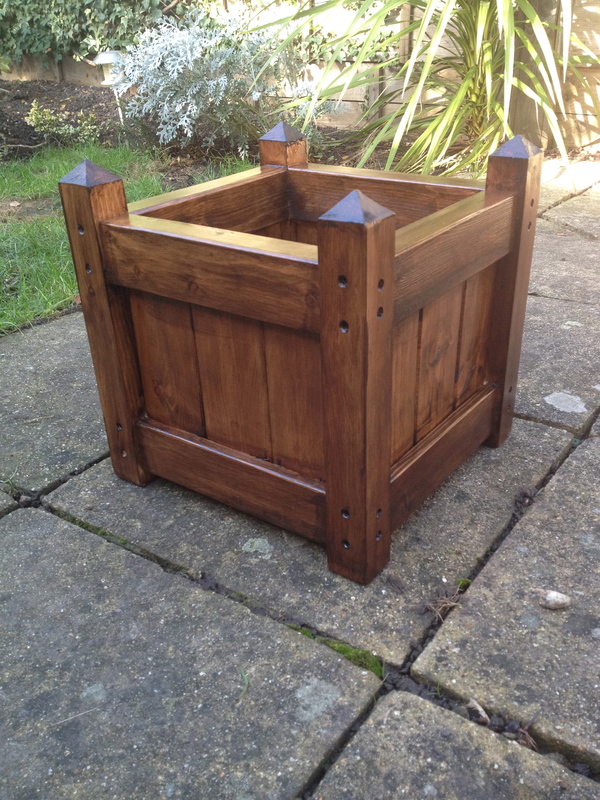 I bought a 14″, unfinished pine wood planter from ebay for £20. This was quite a lot cheaper than similar products in places like Homebase and B&Q. Whether the planter was to be decorated with fabric, or not, first it needed to be treated so that it would stand up a bit better to the perpetually cold and rainy British weather (today is a fine example – cloud, drizzle, the odd rain storm…and it’s June. Really, weather, if you received school reports they’d all say “Must try harder!”). I used two coats of Ronseal interior varnish to give it a deep walnut colour, followed by two coats of Ronseal clear outdoor varnish to make it weatherproof. 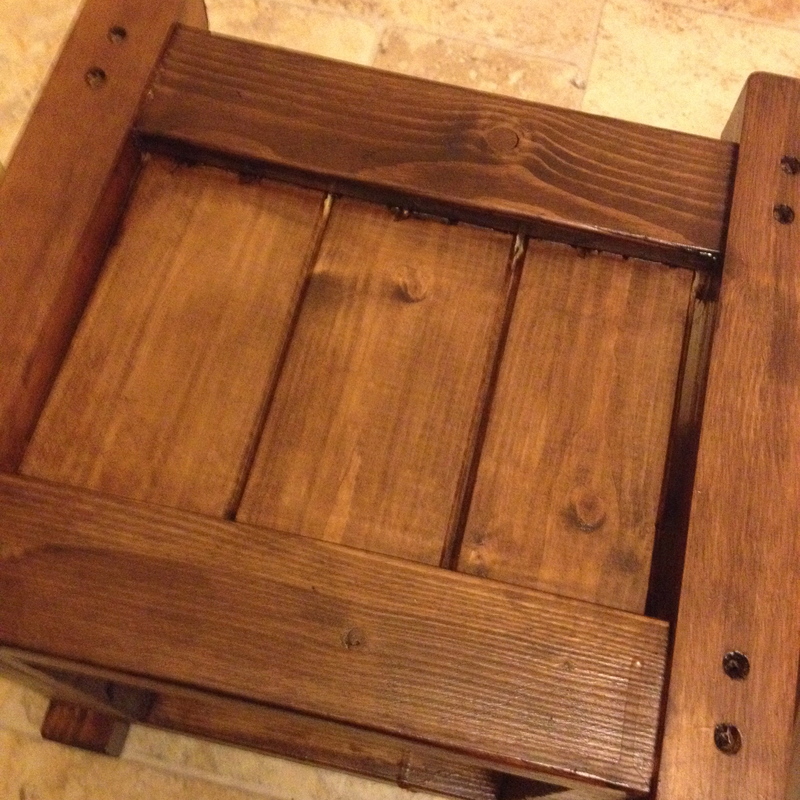 First coat of wood stain on the planter. The varnish I used is for interiors, but it doesn’t matter because I sealed it afterwards with a clear varnish for exteriors. You can skip this step if your wood stain is for exterior use, but I just used some I had left over from another project. After two coats of walnut wood stain and two coats of clear varnish. The clear varnish does give a little extra shine that you don’t get from the coloured varnish alone. 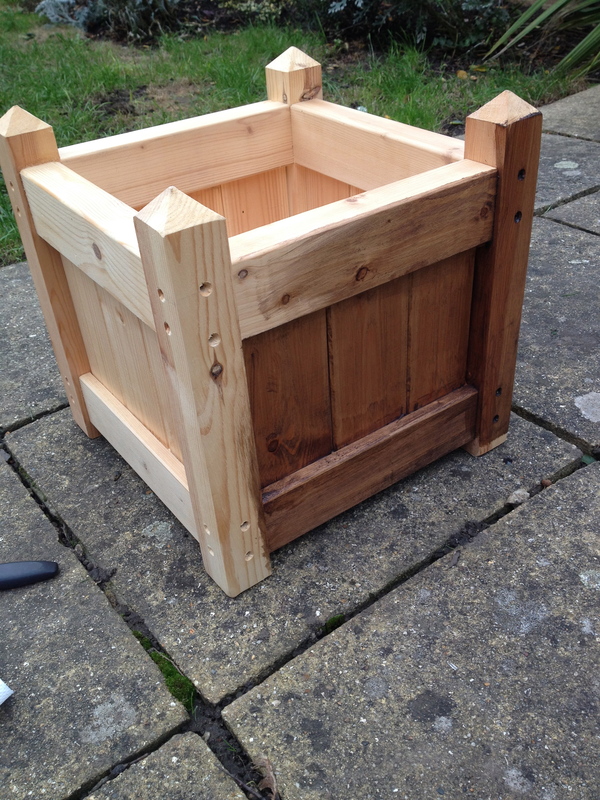 Next, I measured the panels on the sides of the planter and used a ruler and felt tip pen to create a paper template. Pinning the template to the fabric, I used dressmaking scissors to cut four identical rectangles from my fabric. My bird print fabric was also an ebay purchase, but unfortunately the seller is now out of stock if you were after the same. I bought two fat quarters, which cost me just over £7. For your own sanity, I would suggest purchasing a woven fabric, like cotton. Getting the fabric onto the planter will be much more difficult if there’s any stretch to it. 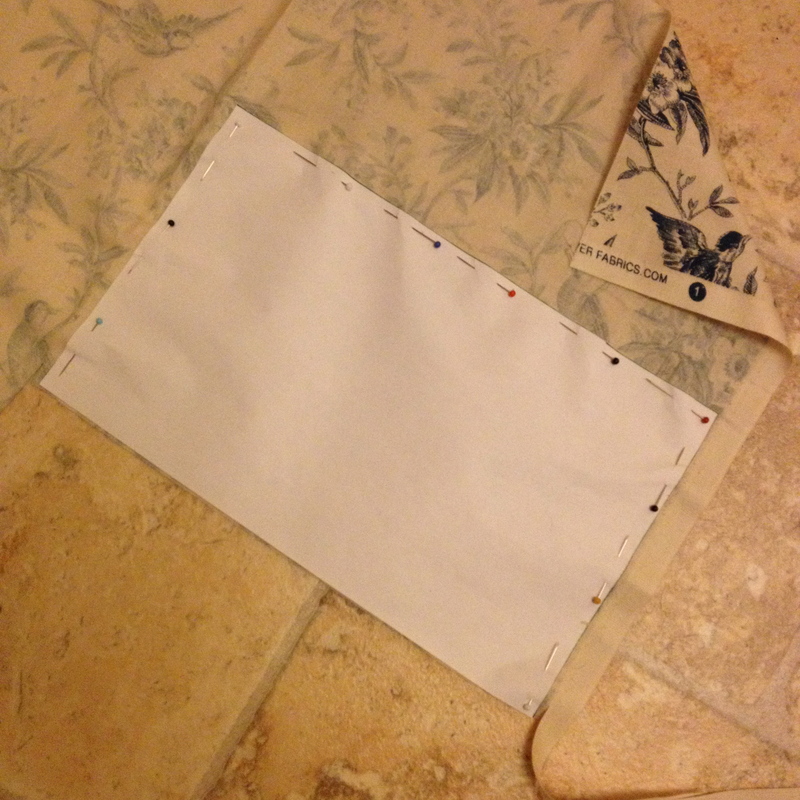 The paper template pinned to the back of the fabric. Instead of marking the fabric, I just cut around the template. Cut four, in total. This is where the Mod Podge comes in. There are lots of different types of Mod Podge available for different types of projects. I used the ‘Outdoor’ one, which is supposed to be a bit harder, a bit more water resistant, but is also slightly less transparent when it dries than some of the other varieties. Apply the Mod Podge liberally to one side of the planter with a foam applicator (it dries pretty quickly, so you’ll want to do just one panel at a time), and place one of the rectangles of fabric on top of the panel. 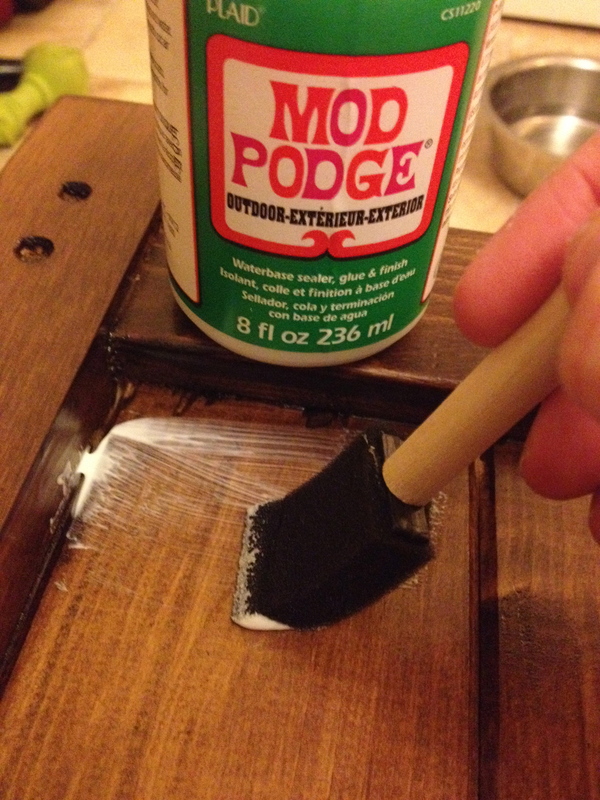 Once you’re happy with its position, apply a second coat of Mod Podge over the top. This will look white when you put it on, but have faith, it will dry clear. Repeat this step for each of the panels. 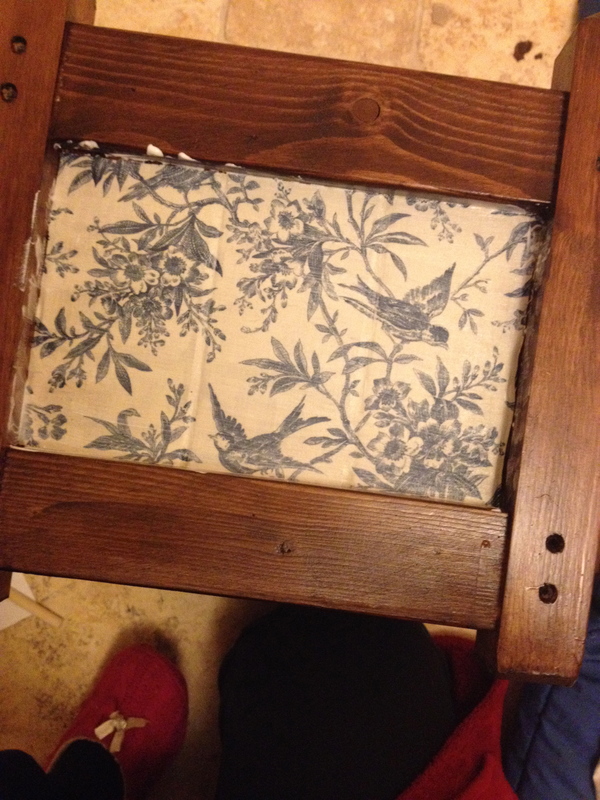 The panel on the planter where the fabric will be attached with Mod Podge. Applying a layer of Mod Podge to the panel before laying the fabric on top. Lay the fabric over the Mod podge and add a second layer of Mod Podge over the top. Wipe away any excess around the edges with a paper towel before it dries. Wait 24 hours and then add another coat of Mod Podge to the panels. You may also want to add one more in addition to this – it all helps to make the planter last a bit longer once it’s out in your garden and exposed to the elements. 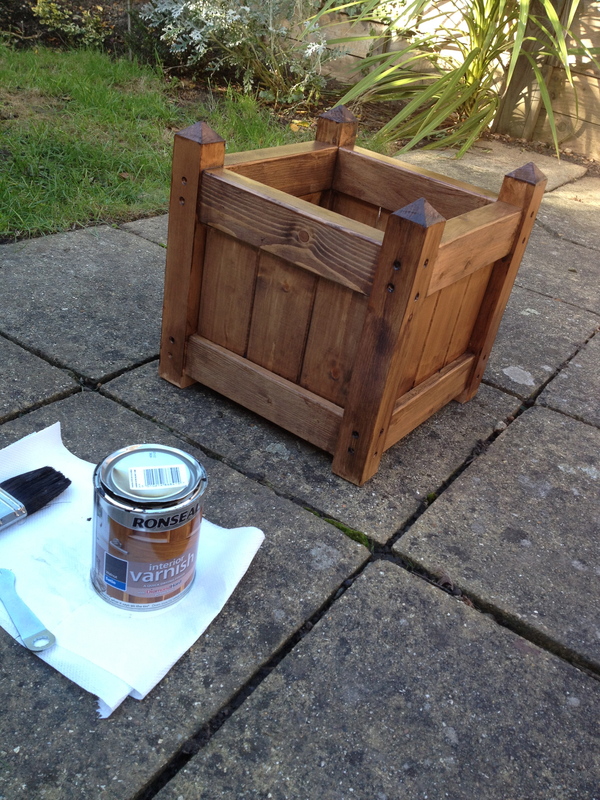 After letting the Mod Podge cure for a couple of days, I took the planter outside and sprayed over some clear acrylic – just one more layer to help it to stay looking great for as long as possible. Finally, I attached a liner to the inside of the planter using a nail gun. 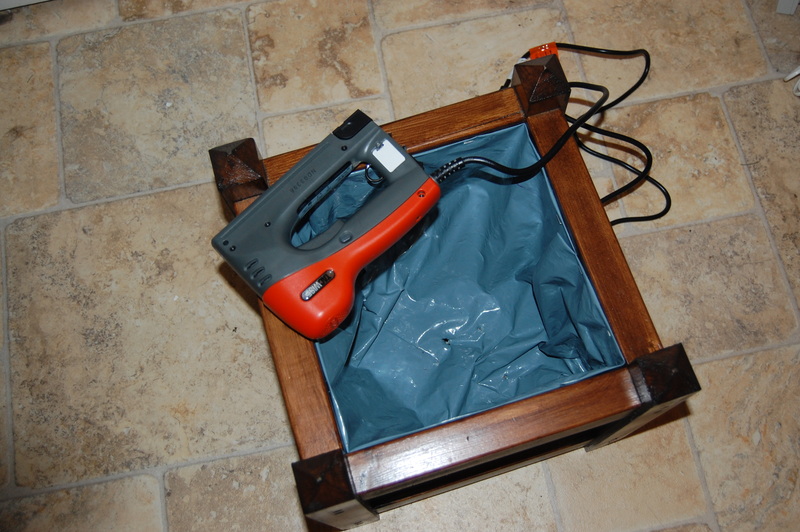 I used a heavy duty rubble sack, cut down to size, but any plastic that’s resistant to rips and tears will do. The important thing to remember here is to include drainage holes. I just snipped four or five into the base of the liner. 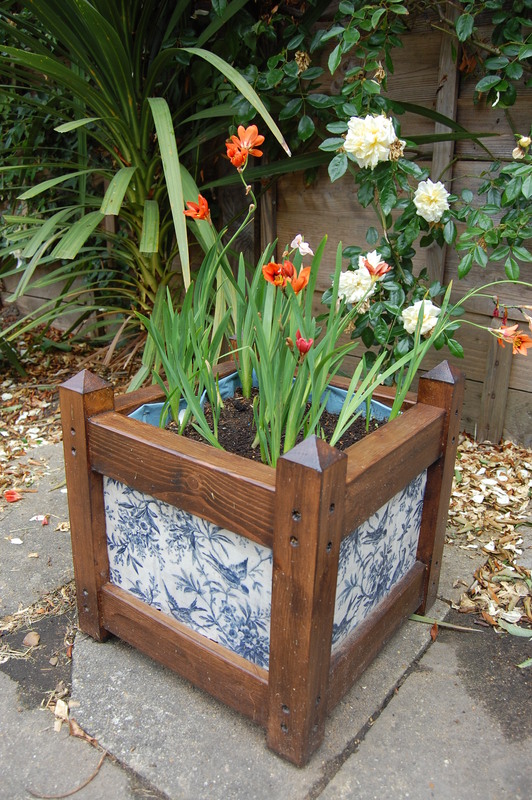 This step is optional, but it will help to keep the wood inside the planter from rotting quite so quickly. Nevertheless, without this step you’ll probably still get a good couple of years out of it. 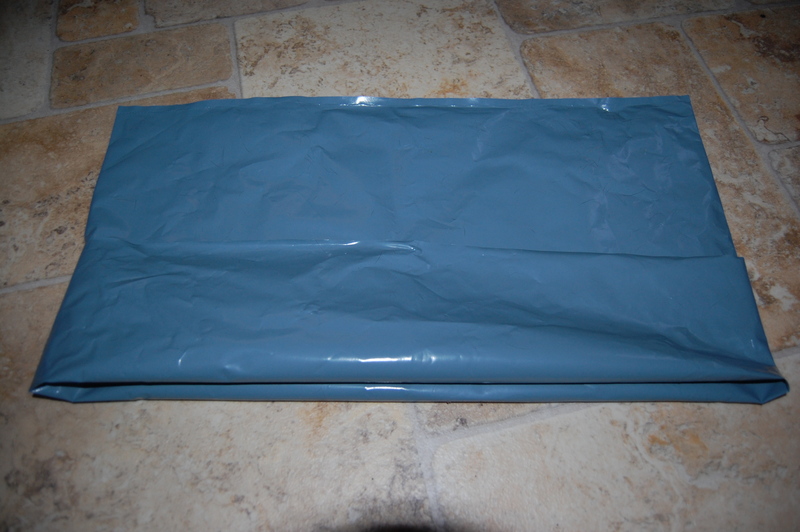 I fashioned a rubble sack into a plastic liner for the planter. Using a nail gun, I stapled the liner to the inside of the planter, but this could be done using just a hammer and a a few nails, if you prefer. Finally, finally….plant ‘er up. 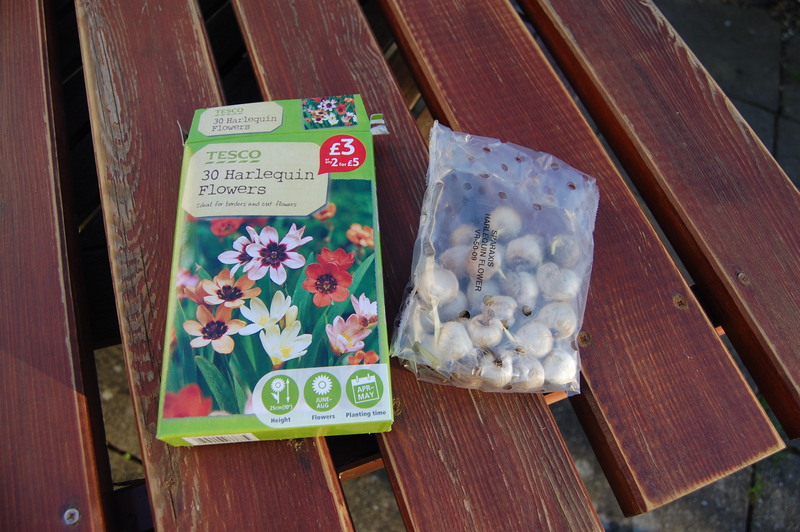 I popped some Harlequin flower bulbs into mine back in April and they’re just starting to flower. Gorgeous! 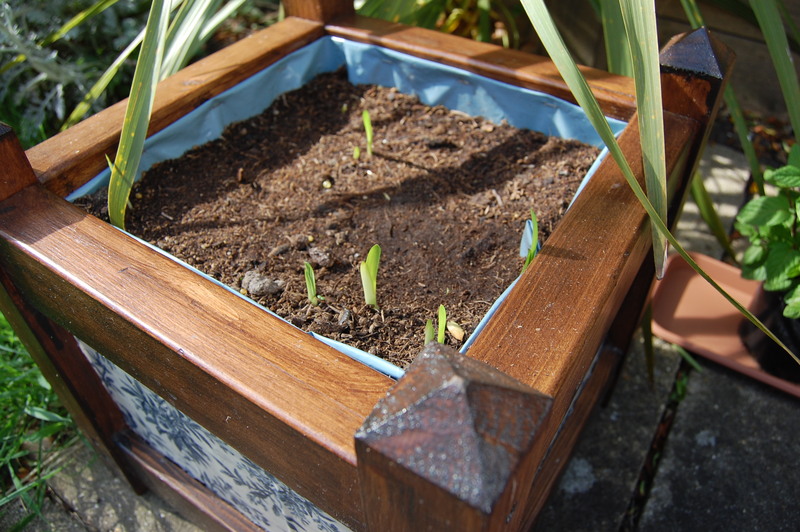 Two months on and the planter hasn’t changed a bit, so all those extra layers of protection appear to have paid off. 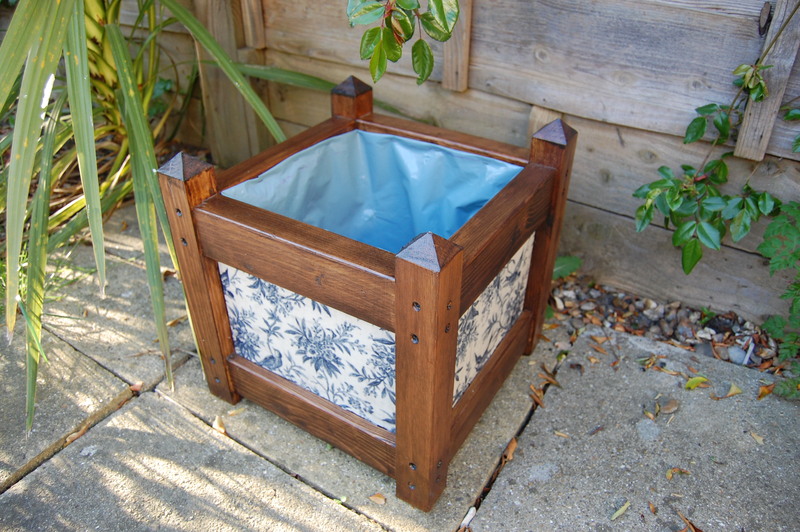 The total cost of the project, including the planter, fabric, Mod Podge and varnish (I already had the wood stain and acrylic spray knocking around in a cupboard) was a little over £40. I’m now feverishly looking for other things to decoupage in my garden – I’ve experimented with a terracotta plant pot and I’m working on an overhaul of the picnic bench. Can you think of anything else that might benefit from a Mod Podge-inspired makeover?